And thank you Rebecca Lippiatt (Photography) for the photos you have taken to help us share the story. They are wonderful! I am looking forward to hearing, seeing, and feeling her Story. It would be great insight and gain of knowledge of this History through Mixed Media Art. I attended the opening of this show at the central library in Ottawa last week .After laughing,brought to tears ,humbled ,I felt honoured to be present ! This past week ,I saw the show at Gallery 101 in Ottawa .i was amazed at the size of the piece of Uncle George, I had assumed from the visual perspective of the film and his story,the piece would be larger,,,it’s presence still rests in my mind and heart .i must thank all involved for such clarity to the tragic circumstances that brought this show to all who have had the pleasure of your energies! Thank you for creating this time for first peoples stories to be heard. Thank you for gathering us together. Lana, you are such a beautiful human being. Lana, it was an honour to hear your story, of healing, the strength of your voice and the love you shared. “I want to take the time to thank you for being who you are and for your talent. Thank you for opening yourself up to the world by sharing your personal history. You may not want to consider it, but one way or another you are a heroine, and today’s world needs someone like you, to change, modify and illuminate the steps taken by others. Je veur prendu le temps de vous remercier pour votre personne et votre talent. Merci de vous ouvrir au monde en partagiant votre histoiré. Vous pouvez ne pas le coin deris, mais d’une façon ou d’une autre vous ètes une heroine et le monde d’aujourd’hui á le temps précis a besion d’une personne comme vous, pour changez , modifier it ensoleeller des pas des autres. (I want to take the time to thank you for being who you are and for your talent. Merci. Thank you for everything and keep like that. Thank you for sharing your journey of healing with us. Listening to you speak about your art and why you added different elements and processes gave me so much more understanding. Thank you for making such an awesome documentary. Thank you so much for your courage and resilience to continue to tell your story. Bless you for continued Boldness to share. We pray for open doors … wherever you need to go. Thank you for your love and friendship. We’re blessed to know such a beautiful iskwew (woman). Thank you, Lana, for sharing who you are in all its beauty and grandeur. This is a wonderful exhibit, Lana, and good to learn more about what is behind the works through Beth’s film. This work and the realities and questions it raises should be shared with more communities. A wonderful and meaningful interpretation of your art. A great film to be shared. This is a beautiful gift. Honored to hear your voice. Lana, ninaskoman (I am grateful), this was beautiful. Thank you for sharing your gifts. Thank you for sharing your art and your reflections about the impact of residential schools and individuals and communities. This is a wonderful work which speaks without words… about the loss of words and what went with them. It communicates. What a blessing to experience your movie, your artwork and your story in the first person. It is very profound and hits me in the heart. Gorgeous work Lana! Absolutely adored your paintings. You are such an inspiration! Thank you for sharing your vision and your work. Congratulations on your installation. Only got to see the still works. Lana, thank you for sharing your stories and art work. Beth, thank you for sharing her story. Reconciliation is so important as our society changes, year by year. The Racism and hate needs to be acknowledged so all can change their ways One at a time and teach their kids so can be seen one generation at a time. We need to love and respect each other. If we can’t be nice then just don’t be mean and look at why you are the way you are! Thank you, merci, Lana and Beth, and everyone involved in this project for sharing, with such beauty and depth, this important information and message to the greater community! Keep making your voice and message heard. Thank you Lana. I really enjoyed sitting and watching the film. Very inspiring for me and I resonate with everything you shared. Bless you on your healing journey and success. Dear Beth Wishart Mackenzie!! How and where on this earth can we maybe still be watching your powerful documentary? Nanaskahmoon kahkiyaw nimis sahkitin kiya Ni Osawan kehew! I am very grateful for everything my little sister. I love you my little sister. Lana, your reflective artwork encourages me to also reflect on life events. Thank you. Thank you Beth and Lana for your years of preparation to share this story with Canadians and beyond. I know them as syllabics. Thank you for showing us the details. Very powerful presentations. Adds so much to the depth portrayed in the artwork. Thanks. Thanks for deeply moving and powerful paintings. Thank you for sharing your story. It was an honour to hear it. I’m really glad I was able to hear your story through your art, but also in your voice in the documentary by Beth Wishart MacKenzie. I think not enough people have had the chance to really know about Residential Schools and intergenerational trauma. I think this is a great way of sharing this with others. Great show. All the best. So glad these cultures have managed to survive. Lana, meegwetch (thank you) for your generosity, your willingness to share profoundly moving emotions and artistic practice. I am honoured to host your show at the ASHUKAN CULTURAL SPACE. Beth, your collaboration in making the film and visually documenting Lana’s narrative is fabulous and perfect to present alongside the works. Your work moves me, tears, and voice caught in my throat. I feel also joy and pride of one to stand strong in your life. Nia: wen Ko: wa for such generosity in sharing your story and artistic process. Congratulations to both of you Lana and Beth for such a powerful installaiton/exhibition/film that allose us to witness the resilience of Indigenous people and the strength of art. Thank you so much Lana for being who you are. It’s wonderful that way, perfect, real and genuinely inspiring. The magic of life is with your spirit, always and forever. You transform pain and grief into beauty and teaching. Thank you for teaching me. Meegwetch (thank you)! pour cette installation. Trés emouvant, l’être humain est capable de faire comme du bien. Thanks for this much needed space and conversation. Muy Bonito lugar, las personas son muy amables. A very powerful and moving exhibition. It took great courage to share the history. Thank you. Lana, thank you for your wisdom and courageous work to touch our hearts minds and spirits with this forgotten narrative. Wow! Quelle prefondeux. Vous êtes trés talentueuse et vos œvreus sont trés inspirantes. Un espacio lindo y miy importante para apoya a los artistas indigenas.Gracias per se parte de un movimicito que aprecia y quiere coserva la culture de cote contierte! Good job! We love it! Beautiful. Live every year. Keep up the beautiful work. Your artwork speaks to the heart. Thank you for sharing your work. L’eau sa mouille. Le feu sa brule! (Water makes wet. Fire, it burns! Woua cette chanson m’a donné des frissons. J’ai adoré! Nous avons encore tant à découvir et à apprendre des Premières Nations!! Vive les projets comme Ashukan! Longue vie à vous. We are all treaty people. It took far too long. Thank you for sharing your knowledge and history with us today. My grandmother passed a few years ago and she used to share knowledge of our family history when I would visit. Your words about how you wished you could ask more questions and understand better resonated with me very well. Especially as a white woman in western society, it gave me a drive to understand my heritage and culture better. Safe journeys through life. Thanks for sharing your culture and history. Firstly I am very sorry about your uncle and how your family and all First Peoples were forced to go to such cold, dark place, even though I wasn’t there and I’m not Canadian either, I still feel sad and responsible since I am living in here. We/I will support your art and pass your story and First Peoples’ story. Thank you for speaking up. Thank you for the beautiful description of your process, and for the exhibition and conversation. Moving, inspiring, challenging. Many thanks. Your story of resilience is an inspiration! Thank you for sharing such a personal story & for the incredibly beautiful and moving pieces! Thank you, Beth & Lana, for inviting us into your art & your stories. And thank you Gallery 101 for holding a space for this beautiful conversation! Lana and Beth, what a treat to witness this wonderful collaboration that testifies to the healing power of Art and the strength of the human spirit – as well as film’s ability to reveal and touch the human heart. I am proud of both of you. Lana and Beth, Thank you so much for coming to Ottawa and sharing your stories and art forms. We have enjoyed spending time with you, learning more (isn’t that the beauty of connecting?) Thinking more and appreciating life more! Thank you – you are so open and courageous when you tell your story through words and art. Merci, thank you for opening the world to an ignored reality! All the best on a successful tour. We loved having the work in G101, and I really enjoyed watching/listening to Lana’s artistic process and connection to family, and your eye as documentarian, Beth, was spot on. Thank you for giving me insight, knowledge, feeling, and appreciation. Thank you for sharing your story thru art. Art is also about truth & traditions! The Territory identified as Chief Drygeese is untrue! Please share the true identity and not the one created by Gov’t’s. Thank you for sharing your personal story and bringing important issues to forefront. Thank you for your truly inspiring sharing of your story through your voice and art. The piece of 3 generations particularly struck my heart. Thank you for your part in binging this important conversation, for creating safe spaces for this important conversation of reconciliation to all of us it will touch. Thank you for finding and sharing your talk. I’m glad it’s on film and captured in your work s that you don’t always have to say it, but that so many of us can continue to hear it. I’m grateful for the conversation about “discomfort” and to check my privilege and luxury to go home and have the choice not to sit with trauma in my home. Meegwetch thank you. Touching words that tell the story thru art. Thank you for letting us see your healing journey, the reclaiming of your family’s path, and the creation of your beautiful art. Thank you very much for introducing me to your uncle and to your wisdom, and entering the pain that accompanied the process of bringing your story to light. 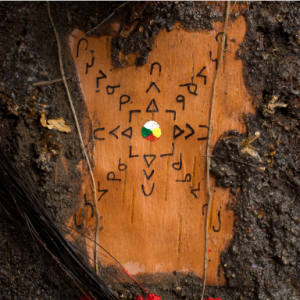 Meegwetch, this has inspired me to find a way to put into art what is so hard to talk about – yet seeing how it instigates important conversations especially with mainstream Canadians. Welcome to Winnipeg! Enjoy your stay. Your work is amazing with lasting impression! Great job, thank you for sharing! It’s sad for me to think that the faith/religion/spiritual/”thing” I’ve been a part of all my life did such wrong to Aboriginals. Seven Generations! Moving and Powerful. Thanks for sharing. Very thought provoking and expressive work. Thank you for your beautiful and important work. Thank you for sharing your family story, your insight and your beautiful voice. Truly inspiring, thoughtful and so very layered with emotion, love and hurt. The video is very beautiful and gives insight to the artist’s mind. Art is a compelling way to make connections, and to make abstract ideas specific through a personal story. Your art is a piece in the puzzle to figuring a way forward. Thank you for sharing so meaningfully through your art. Thank you so much for this powerful display. Your family’s stories and faces personalize this narrative. Quite an inspiration for everyone. Excellent work. Very eye opening, thanks. I like Cosmetic Cree – Wow! Beautiful and eye-catching! And look before speaking – powerful. Thank you for allowing me to help with the installation and preparation for onward movement of this display. It was a great honour. Three Generation #4. So much hurt, but so much love. Thank you for sharing your story and strength through your art. Sending thanks for Three Generations #4. It hit my heart. The person that helps you, needs help too. I had to learn the history on my own and was never brought up in a decent setting to respect the wonderful history of your community. We are all here, my children understand. They will hold the future. Thank you for your contribution and sharing to the kids in library. My kids are interested in your animal portraits and colour them with passion!